We've all been guilty from time to time of letting a little too much dust settle on our window coverings. 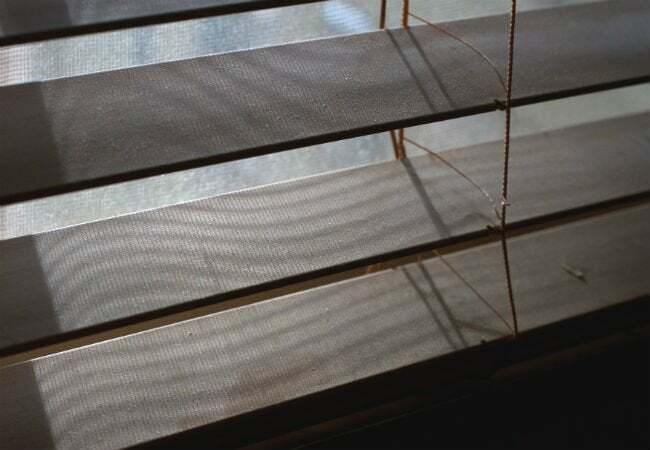 Clear off the grit and grime with one of these three solutions for cleaning your blinds. Blinds often go ignored during our day-to-day cleaning routines. But when we don’t give them proper care or cleaning, these popular window coverings harbor dust and grime, rendering them at best unappealing and—at worst—our home’s biggest dirty little secret. 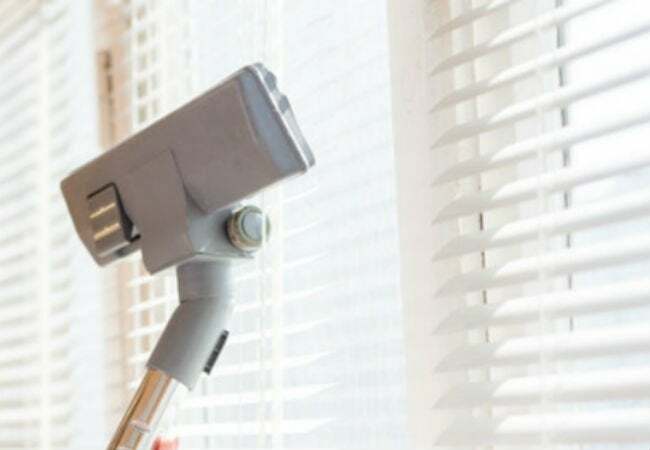 Don’t wait until you see clouds of dust appear whenever you adjust your blinds; instead, try one of these tune-up tips that can restore blinds to their spotless glory. To give your wood or faux-wood blinds a good scrub, fill a bucket with warm water and a little dishwashing soap. Next, grab a microfiber cloth—always best for dust-busting—or, in a pinch, a clean sock. Lightly dip the cloth in the sudsy water (or slip the sock over your hand and dip), then wipe off each slat. For actual wood blinds, you’ll want to use only a small amount of plain water or furniture polish applied directly to the cloth or sock. Do not saturate the wood, as this can damage the coating. Dry either material—wood or faux wood—with a clean, dry cloth to finish. Keep your blinds cleaner between washes with this trick that will add just a few minutes to your routine: First, break out your vacuum and its dust-brush attachment (the one with the bristles). Next, close your blinds, set your vacuum on its lowest setting, and run it lightly over the slats. Tilt the blinds in the opposite direction, and repeat the process on that side. Owners of fabric blinds don’t need to provide much in the way of deep cleaning, as fabric blinds don’t show dirt as obviously as wood or vinyl blinds do. If you notice a small stain, simply blot it with a cloth that’s been dampened with soapy water, and allow the material to dry. If that doesn’t work, the blinds may need to be dry-cleaned. 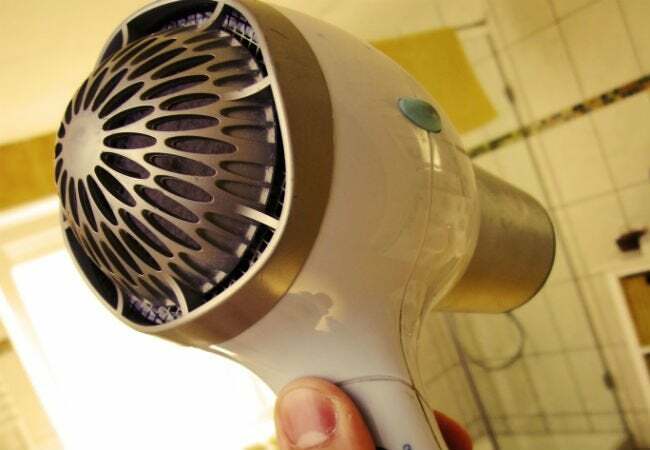 For a quick weekly fix, look to a common beauty appliance: your hair dryer. Set the styler to the cool setting, and blast each slat to effectively remove dust from hard-to-reach spots. Don’t forget to run a vacuum over the floor when you’re finished to ensure that you’re getting rid of the dust for good. 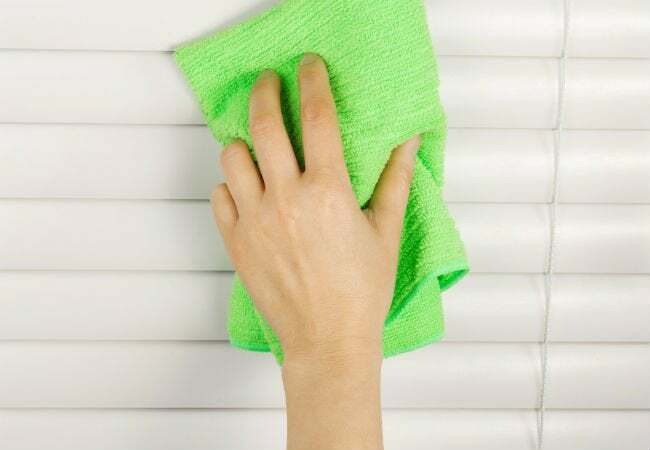 There are a variety of ways to clean vinyl blinds, but if yours are intensely plagued by stains, dust, or grease—especially if they hang in the kitchen—you might want to try giving them a bath. Fill the tub with warm, soapy water, and let the blinds soak in the solution for a few minutes. Next, go over each each slat with a sponge. Rinse with water to remove any lingering residue, and hang them from the shower rod to dry. For in-between cleanings, try this no-water-needed solution: Quickly run a dry rubber sponge over the slats to pick up loose dust particles—that’s it! Keep a clothespin nearby so that when you have to step away, you can clamp the pin on the last slat you worked on so you don’t forget where you left off. Once your blinds are spick-and-span, tilt them open to let your dust-free surfaces gleam in the sunlight.